Let's cover the original misinformation first: The earliest missives warned that microwaved plastic releases cancer-causing chemicals called dioxins into food. The problem with that warning is that plastics don't contain dioxins. They are created when garbage, plastics, metals, wood, and other materials are burned. As long as you don't burn your food in a microwave, you aren't exposing yourself to dioxins. BPA and phthalates are believed to be "endocrine disrupters." These are substances that mimic human hormones, and not for the good. When food is wrapped in plastic or placed in a plastic container and microwaved, BPA and phthalates may leak into the food. Any migration is likely to be greater with fatty foods such as meats and cheeses than with other foods. The FDA long ago recognized the potential for small amounts of plasticizers to migrate into food. So it closely regulates plastic containers and materials that come into contact with food. The FDA requires manufacturers to test these containers using tests that meet FDA standards and specifications. It then reviews test data before approving a container for microwave use. Some of these tests measure the migration of chemicals at temperatures that the container or wrap is likely to encounter during ordinary use. For microwave approval, the agency estimates the ratio of plastic surface area to food, how long the container is likely to be in the microwave, how often a person is likely to eat from the container, and how hot the food can be expected to get during microwaving. The scientists also measure the chemicals that leach into food and the extent to which they migrate in different kinds of foods. The maximum allowable amount is 100–1,000 times less per pound of body weight than the amount shown to harm laboratory animals over a lifetime of use. Only containers that pass this test can display a microwave-safe icon, the words "microwave safe," or words to the effect that they're approved for use in microwave ovens. What about containers without a microwave-safe label? They aren't necessarily unsafe; the FDA simply hasn't determined whether it is or not. Contrary to popular belief, some Styrofoam and other polystyrene containers can safely be used in the microwave. Just follow the same rule you follow for using other plastic containers in the microwave: Check the label. 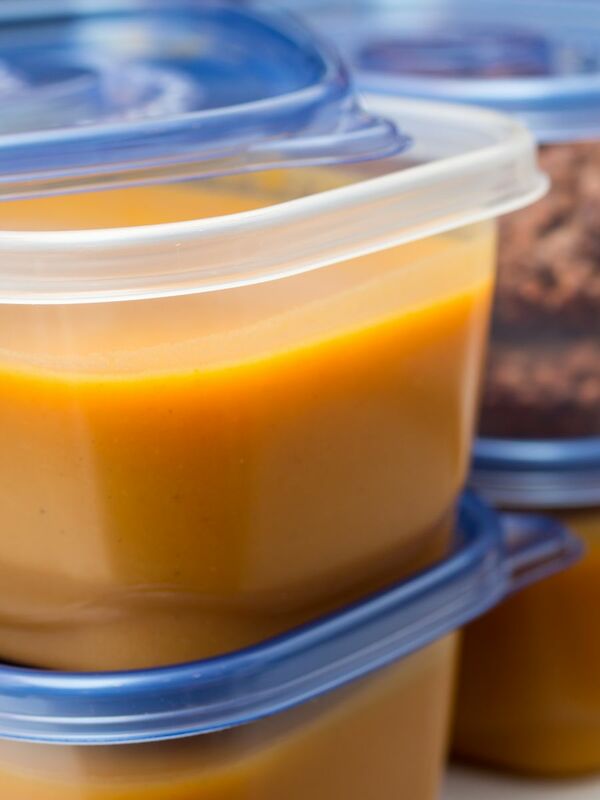 If you're concerned about plastic wraps or containers in the microwave, transfer food to glass or ceramic containers labeled for use in microwave ovens. Don't let plastic wrap touch food during microwaving because it may melt. Wax paper, kitchen parchment paper, white paper towels, or a domed container that fits over a plate or bowl are better alternatives. Old, scratched, or cracked containers, or those that have been microwaved many times, may leach out more plasticizers. Don't microwave plastic storage bags or plastic bags from the grocery store. Learn about "Microwave cooking and nutrition."